I did a bad thing last night. I put a large spoon in a very small bowl and looked away for a moment. This bowl happened to be near carpet and holding red spaghetti sauce and the moment I looked away the spoon flung itself onto the carpet. I looked up at the last moment before the spoon struck the ground. Darn spoon, it held up dinner for a few minutes and I was starving. 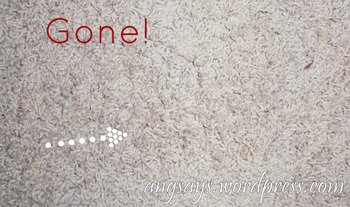 Husband kindly offered to help but it was my carpet stain and I wanted to blog about it. Unfortunately, I did not remember to take pictures until afterward but here’s a re-enactment. Have I mentioned how much I love microfiber? Step One: Gently dab up excess sauce before it sinks into the carpet. Step Two: Dampen microfiber cloth with cool water and blot up sauce. Step Three: Apply warm soap suds to remaining sauce and dab some more. 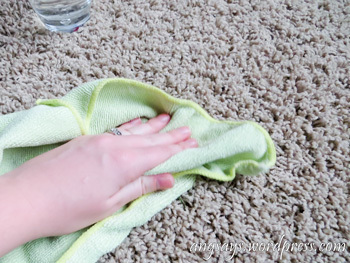 Step Four: Once the stain is gone, dab a wet cloth over stain area to “rinse out” the soap from carpet. This is where the stain was, the other pictures are by the window for better light. Spaghetti Sauce: zero, Angela: 1. 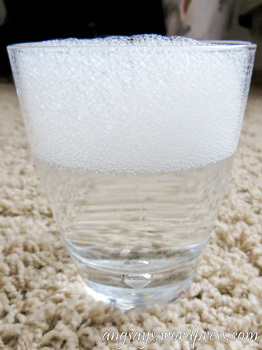 Carpet stains always come out easier when they are fresh but the moral of this story is “Don’t Put Big Spoons in Little Bowls.” However, if you are unable to get the stain out, you can always call a professional. What stains have you conquered? Awesome! With 3 kids, I need this. I also need to keep my house clean. Thanks for this! Your posts are perfect. Do you know how to get spots out of shirts (an easy way)? I spill on myself more often than I like to admit and have found myself cleaning up stains in bathrooms and found that hand soap works well. 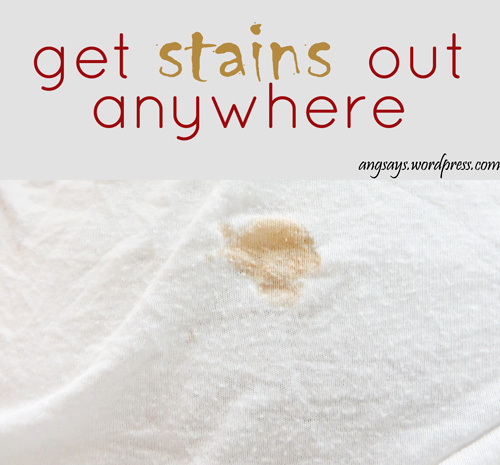 This might sound crazy but as soon as the stain happens, rub it with a little hand soap and cool water. 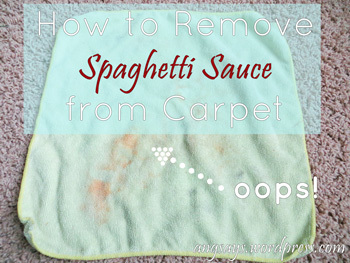 This will greatly remove the stain and then allow it to come out easily in the wash. I also stumbled across a homemade shout recipe here that looks like it works wonders too. You’re welcome. Thanks for hosting! This is great to know! My little girls are always getting things on the carpet. Thanks for linking up!